This is very interesting information. It’s surprising to know only 70% of Americans have Internet Access. I don’t think it surprised me to know that China will surpass in just two years; the growth is not only the result from their population, it’s also because their people are hungry of information and the opportunities of success. The internet will always be one of the most popular forms of communication. Although it has not always been this popular it has become more and more popular through out the years. Social media has expanded also, Facebook, twitter, instagram. These days everyone has a smart phone that allows them to access the internet, communicate with consumers, and continue to share information through online databases.2.25 billion people are online and about 1 billion of those users access the internet through their mobile phones.That is not surprising to me by any means considering every person that I know owns an iPhone. It has become an easy and convenient way to find information, stay in touch with others, as well as find out what is happening all around the world. I know this is true specifically because I have friends that live in foreign counties and they also use the internet to stay connected. Romania for example is a poor country, yet many chose to have the ability to access the internet especially because it is a way for them to stay connected with family, friends, news, etc. Facebook is very popular for many back home as well. It is intriguing for consumers specially because they are able to keep in touch with others that live in the states. If I was still living back home, I would make sure I was connected through social media databases and or mobile. I agree your information. The internet will increase our work efficiently, let our life become more convenience. We can search more information that we need or want. I’m an international student so I always use my iphone internet to connect with my family and friends, sometime face time or whatsapp. It is very convenient and i don’t need to pay the international phone fee so it’s save money. This reminds me of another article I read about how businesses will eventually be focusing on developing and third world countries as expansion opportunities and what the realities of that would look like. I think that their first big push into smaller, developing nations will be via the internet. Particularly, I think we will see a rise in e-commerce through our phones. Provided you can get a wireless signal (and with satellites you can now get a signal almost anywhere), and you have access to at least enough electricity to charge the thing, mobile phones can help businesses reach markets that they’ve had little to no contact with previously. The technology is already there to support it, businesses just have to get on the idea now. To be honest, I am a little surprised, but in my opinion, the two main reasons why Chinese will surpass English-the most widely used language worldwide in just two years are large literate population and the rapid growth of economies in China. Furthermore, I really agree that increased Internet usage can directly links to economic improvements. As the rapid development of high technology, today, we have Facebook, Twitter, blogs, MySpace, LinkedIn, and so on. More convenient communications and travel cause globalization. For international business, the world will always grow smaller. Like electronic business, it enables a firm or individual to conduct business over an electronic network, typically the internet. However, because those social media networking provide people a broader platform to share their experiences and opinions, also, a lot of people use mobile broadband connections, meaning at anytime and from anywhere, from this point, I think it will really increase the difficulties of crisis management for PR professionals and business (one example is negative word-of-mouth throughout internet). In a matter of very few years, the Internet consolidated itself as a very powerful platform that has changed forever the way we do business, and the way we communicate. The Internet has given an International or a “Globalized” dimension to the world. Internet has become the Universal source of information for millions of people, at home, at school, and at work. With a very low investment, anyone can have a web page in Internet. This way, almost any business can reach a very large market, directly, fast and economically, no matter the size or location of the business. With some Social Media, people everywhere are expressing and publishing their ideas and opinions like never before. The internet is a blessing and a curse. It is good that in that it gives affordable/free information and education to those in developing countries who don’t have formal libraries or schools. But, imagine if everything was available and done through the internet. Hackers and terrorists can take over and restrict or prevent passing of information. What if a natural disaster happened and wiped out major servers that connected communities or stored valuable data? If everything is online and stored in the “cloud,” how do we defend ourselves against a major interruption? I’m envisioning an episode of Revolution here. Far as only 70% of Americans having internet access, I think that is only counting paid subscriptions. I’m pretty sure that there is a very small population of Americans that have zero internet access because they are too busy enjoying retirement or fear the computer all together. I agree. It is scary that we depend so much on the internet. Without it we are helpless. It would be a huge interruption to be without it for even days. It is very true. Most of people depends on internet at presence. Even when I’m taking with my friends they use internet by their smartphone. For company this is a great chance to get awareness by internet. their customers are always there. Unfortunately few people can live in this world without internet. It is true that the mobile getting developed so fast, and most company starts to doing their web design based on mobile first. It would be better fit on that tinny screen. Also, e-marketing has gone beyond just the desktop and laptop, now we had pads, 4g, LTE phones, more and more devices connect to the internet, eventually it turn out more business opportunity to the market. My interest in the internet topic is speed and affordability. Using Ookla.com (a company that tracks global internet data, I tracked the average internet speed and cost for the USA and China. Displayed below are the Mbps and cost for 2012, the date this article was written, verses todays speeds. It is really interesting to see the jump China has made in internet speed while keeping prices low, a problem that the United States seems to have. However with gigabit speeds gaining traction it will be interesting to see how current providers will react. I think moving forward we can expect lower internet prices and faster speeds, as google is showing that their is a market for 1-gig internet. Companies like Century Link, and Comcast are already looking to increase internet speeds, to remain competitive. Increased competition in the telecommunication market is helping to increase service. I’ve spent a lot of time in the world’s poorest countries, interacting with local people, asking them questions and hearing their stories. I have yet to visit a community that doesn’t have at least one mobile phone with internet access. Most communities I visit have dozens or hundreds of internet-connected devices. Even refugee camps have cell phones and tablets. The world is becoming more and more connected each and every day and I see so much value in communities around the world tapping into the connected online world. The increasing number of people having access to internet does not surprise me. 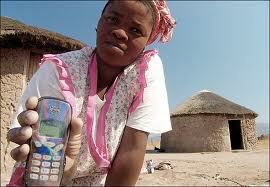 Even some tribes have mobile phone, so information around the world will be shred by more and more people. It’s dangerous to think that people in poorer countries do not have access to internet because once they get internet, they can go smart. Thus, many companies need to prepare for their economic and intelligent growth; there is a possibility that people in those countries become a threat to big companies.